UPDATE: JOIN OUR ALUMNI GAME! 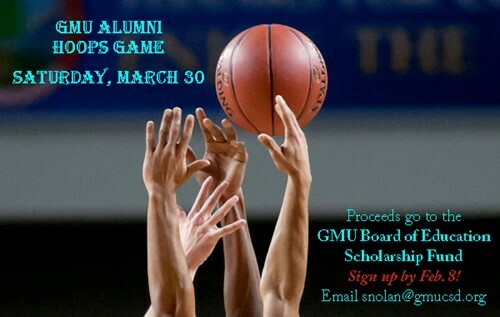 The GMU Board of Education invites GMU alumni to participate in an alumni basketball game to benefit the board’s Scholarship Fund, which provides scholarships for graduating seniors. The event is set for Saturday, March 30 at 1 p.m. in the main gymnasium. Any alumnus who is interested in competing in the game should call District Clerk Sheila Nolan at 607-783-2207, ext. 140, or send her an email at snolan@gmucsd.org BEFORE FEB. 15. This promises to be a fun-filled Raiders event. Thank you for your interest in promoting academic excellence at GMU!